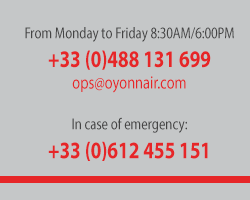 Oyonnair has its own aircrafts based in Lyon Bron, Paris Le Bourget and Rennes airports. Versatile aircrafts for up to 4 passengers, configurable for single-stretcher medical evacuations, VIP transport or cargo. Our Citations Mustang are convertible: single stretcher + 2 passengers, with special oxygen, power supply, drip stand and a loading ramp.